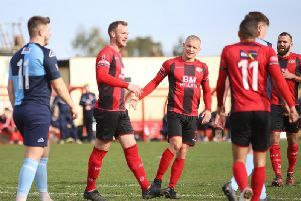 Kettering Town’s first game in hand on Evo-Stik League South Premier Division Central leaders Stourbridge ended in a damaging home defeat to play-off chasing Biggleswade Town. Star power is all very well but if you don’t work as hard as your opponents, only one thing will happen. I think everyone is always a bit cautious when they call someone else’s work-rate into question but, unfortunately, it was all-too obvious in the second half at Latimer Park. Before the break, the Poppies had played their way into the game nicely and, to be honest, were playing quite well as they took a deserved lead. But right from the start of the second half, Biggleswade upped their work-rate and never really looked back. They were reduced to 10 men and yet they still worked their socks off and caused problems for the hosts. Kettering quite simply froze, too many players hid away and it wasn’t until the final 10 minutes that they really got a grip on things again. By then, it was too late. The Poppies squad is full of talented players for this level but nothing will ever replace hard work. It’s the first time this season that element has been properly called into question. And it should not have to be called into question again. Remember when the Poppies were defensively solid week in, week out? Well, they’re not anymore. This will be a massive concern for Marcus Law. Even in the crazy world of non-League football it’s almost impossible to understand how a team that started the season in such miserly style when it came to conceding goals, can be opened up as easily as they were at Latimer Park on Tuesday night. Problems when defending corners and other set-pieces seems to have been a recurring theme for a few weeks now and it struck again on this occasion. Early on in the season, the Poppies were set up with almost a five-man defence with the full-backs putting in energetic displays on either side. Durrell Berry has left, Lathaniel Rowe-Turner can’t get in the team and when other changes have been made, the Poppies have still found it hard to keep the goals out. They seemed to have turned the corner again with a fine 0-0 draw at King’s Lynn Town and a generally solid defensive display against AFC Rushden & Diamonds at the turn of the year. But they have now conceded five goals in the last two games, four of which have come from set-pieces. That needs to be sorted out, and quickly. It’s worrying how much one key man was missed. It was glaringly obvious just how much the Poppies missed captain Michael Richens on Tuesday. He is, perhaps, underrated when it comes to the job he does. He makes tackles, he has a good range of passing and he provides a useful shield in front of the backline. And this is where you have to have sympathy for Marcus Law. With Richens suspended for three games, the plan would have been to use Brett Solkhon in that role. The long-serving staff was hit by a calf injury in last weekend’s draw at Coalville Town and that meant another reshuffle. Law opted to put Gary Stohrer in that midfield area on Tuesday with Marcus Kelly reverting to left-back. Ultimately, Biggleswade’s midfield duo of Kieron Forbes and Donovan Makoma controlled that area of the pitch particularly in the second half, something you’d like to think wouldn’t have happened if Richens or Solkhon had been about. The Poppies skipper will be back for the weekend and boy do they need him. Rhys Hoenes is a marked man, he needs to tread more carefully. The exploits of Rhys Hoenes have been one of the hot topics on social media after almost every game this season. Make no mistake, the flying frontman does win the Poppies plenty of penalties, at least he did anyway. He has developed a reputation of ‘going over too easily’ and while that may be the case, there haven’t been many times, from what I have seen at least, when he has been hauled down in the area and the penalty decision has been hotly disputed. The one attribute he has is pace and whenever he is caught then he tends to make the most of it. It’s not a new thing, it happens everywhere. But word spreads pretty quickly in the murky world of non-League football where everyone seems to be out to shoot everyone else down. Marcus Law has gone as far to question whether referees are entering Kettering matches preconceptions when it comes to awarding them penalties. But Hoenes must tread more carefully himself. He was sent-off towards the end of this game for getting a second yellow card for what did look like a pretty clear dive. He is a quick and talented player and should let that shine most of all. But, by the same token, if he is fouled, he is fouled and no referee should have their mind made up before any incident happens. There is now virtually no room for error over the next two matches. The Poppies went into this game four points behind Stourbridge with three games in hand. They could probably afford one mistake and they made it in extremely disappointing fashion. Now the room for error has got that bit smaller and they really can’t afford any further slip-ups in the home matches against Royston Town on Saturday and Coalville Town next Tuesday night. They must dust themselves down, take the criticism on the chin and come out and show just why there has been real belief in them from their supporters throughout the majority of this season. Six points from the next two games would put them within striking distance of Stourbridge ahead of the showdown between the top two in a week on Saturday. Kettering must go into that game with some sort of momentum. They need to produce the appropriate response at Latimer Park this weekend.